In 2008 a unique fundraiser called Pelotonia was founded in Columbus. It’s a bicycle tour that raises money for cancer research, specifically for the Ohio State University Comprehensive Cancer Center – James Cancer Hospital & Solove Research Institute (OSUCCC). Since its launch, the grassroots charity has raised over $139,000,000. Pelotonia takes place each year in early August and spans an entire weekend. Riders can choose from six different routes with corresponding fundraising commitments: 25, 45, 55, 100, 135 and 180 miles. The event, which has grown substantially over the past eight years, is the product of thousands of sponsors, donors, volunteers and riders working together with “One goal” in mind: ending cancer. This year 7752 people are registered to ride in Pelotonia, and three of them are from the Allied family. In a little over a week, Pete Satre (Research and Technology) and Mark Rowland (Industrial Sales) will both be riding for their sixth year, and Jayci Haase (marketing) will be riding for her first time after volunteering last year. Satre, Rowland and Haase will be riding a combined 380 miles, and are set to contribute over $6000 to the cause. One hundred percent of the donations they collect will go directly to OSUCCC, where advancements in cancer research are being made repeatedly. This is a fundamental component of Pelotonia – no rider fundraising dollars go toward overhead costs. 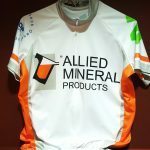 Although Satre, Rowland and Haase are riding in separate Pelotons (rider groups), Allied is proud to have three employees participating in such a great cause.